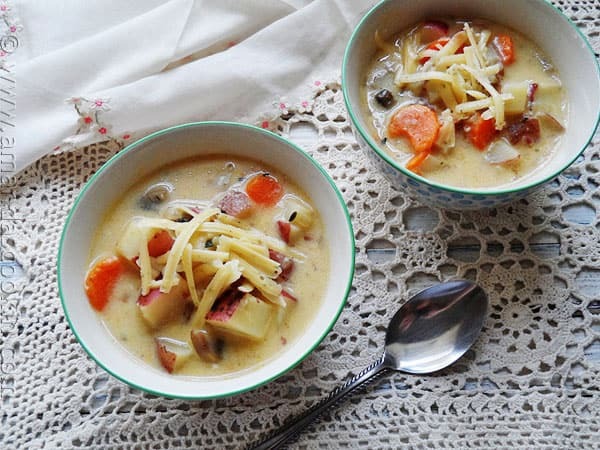 There’s nothing like a piping hot bowl of soup chocked full of potatoes and other deliciousness to take a bite out of winter’s chill. Garlic and potatoes are the star of this soup recipe, so if they are among your favorites, you will want to give this one a try. This is great for lunch and easily keeps in the refrigerator or freezer as well. It’s been very cold this past couple of weeks in southeastern Wisconsin. Biting winds an temperatures below zero make outdoor activities pretty much nonexistent. 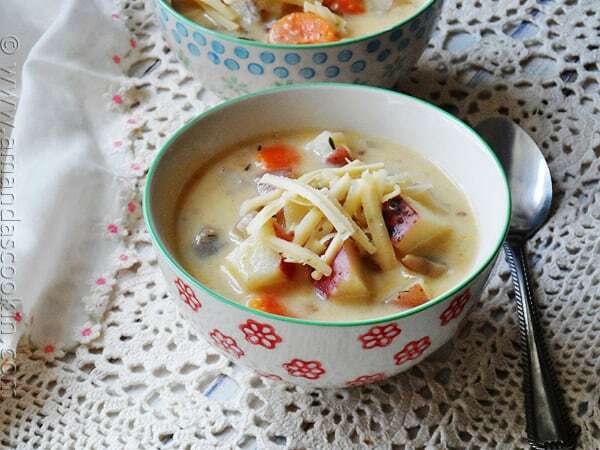 If you do have to go outside, coming in to a steamy bowl of this rustic soup will warm you up in no time! Serve with a hunk of crusty bread or your favorite crackers. My husband and youngest son love ice fishing. They don’t have a heater in the shanty, so taking along a Thermos full of hot soup is a great way to keep the chill away as well as the hunger pangs. 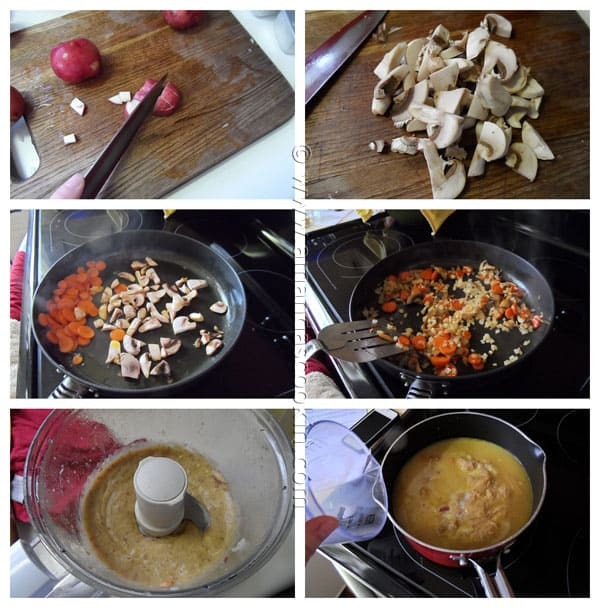 Chop all your vegetables (potatoes, carrots, mushrooms and onion) and saute them in butter. Add the garlic and some broth and do a bit of simmering. You’ll run about a cup of the mixture through your food processor and dump it back in with the rest of the soup to act as a thickener. Add milk, seasonings and thyme and you’re just about done! 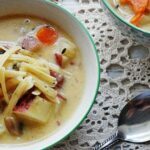 If you’re like me and you love potatoes, and love soup too, here are some other recipes you might like! Melt one tablespoon of the butter in a large skillet over medium heat. Add carrot slices and saute until their color begins to change, about 5 minutes. Add mushrooms and saute two minutes. Add remaining tablespoon of butter and the onion; saute 3-4 minutes. Add garlic; saute 2 minutes. Add potatoes and two cups of the broth; bring to a boil. 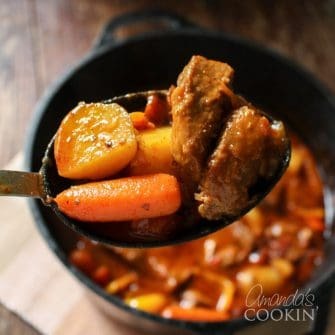 Reduce heat; simmer 15 minutes or until vegetables are tender. Transfer 1 cup of the mixture to a blender or food processor; puree until smooth. Transfer contents of skillet to a saucepan. Return pureed mixture to saucepan as well. Stir in remaining broth and milk; season with Kosher salt and black pepper. Add fresh thyme. Bring to a low boil for a few minutes. Reduce to a low and simmer for 15 minutes to allow soup to thicken. Stir in garlic cheese and simmer until cheese is completely melted. Sounds (and looks) delicious. I’ve been making a new soup every week and I’m putting this recipe next on my list! Thanks!!! This soup would be just the thing for a cold day like today. It has been drizzling rain all day with temps in the low 30’s. Just nasty out there. A bowl of this would cheer me right up! Beautiful soup, Amanda! Roasted garlic + potatoes = heaven.